Located on the bluffs overlooking the Ocean, Pacific Shores Motorcoach Resort welcomes you to our manicured lawns, heated pools, fitness center, pickle ball courts and trails to the beach. Come join us and have some fun. We spent the entire winter at Pacific Shores and had a spectacular visit. The staff is friendly, responsive and caring. The facilities are spotless and we made regular use of the exercise equipment and the heated salt water pool. This is a campsite owned park and as guests we were welcomed with open arms. Staying through the winter is amazing. We experienced all that the coast has to offer: rain, snow, beautiful unexpected sunny days and crisp clear mornings. We found the people of Newport to be friendly and welcoming as well. It seems locals and guests enjoy a sunny winter day on the coast equally. The beaches are very dog friendly and most dogs are off leash. It is amazing to see their joy running free in such wide open and beautiful surroundings. Finally we MUST mention the year round Newport Farmer's Market and the Newport Food Coop! The farmer's market provided us with delicious fresh, healthy produce and meat throughout the winter. Again a very friendly and welcoming atmosphere and we will miss this market very much. The Coop was our go to place for other healthy food choices such as milk, cheese and bulk items. We love being able to support local farmers and businesses. We strongly recommend Pacific Shores and the surrounding area for a winter (or any season) visit and look forward to visiting again. P.S. One particular shout out to the AMAZING gardening and maintenance team as Pacific Shores!! These guy work non stop rain or shine. The landscaping is PERFECT and it this crew that gets 100% of the credit for making the grounds and facilities so beautiful and inviting!!! Thank you so very much for all you do!! I stayed on Lot 186 it was fantastic with the raised deck I could see the beach, also a beautiful view of Yaquina head Lighthouse. Had a very hard time leaving this beautiful place. The staff was great and very helpful. Would never stay again! This park is beautiful. "But" each space has individual owners. We stayed in #186 for a week. Unfortunately for us, the owners had another space in the park that they were using until they could take our space over at the end of our week stay.. These NY owners were in our face and space everyday. Non stop, Bring over patio furniture .bbq grill, fire ring etc. For them to use after we left. Of course they told us that these items were their personal property and not for the use of visitors......We barely had enough room on the small patio to put out two chairs for us to sit on. And when If we tried to sit out side to enjoy the ocean view and some quite time, they were there cutting the bushes or watering the lawn. Needless to say we had no privacy. We call the office and we were told that the owner had the right to be in their space when ever they wanted. We were going to check out early but our next site location did not have any availabilty. This was the most unpleasent RV park that we have ever stayed in. Not worth the money or effort. Stunning RV park! Beautifully designed and maintained. Indoor and outdoor pools. Definitely big-rig friendly. No drive thru spots-all are wide concrete pads and are a mix of nose-in or tail-in spots designed for best view of the gorgeous scenery. We stayed 3 nights. The park was quiet, clean, and peaceful. We walked the entire park. There is not a bad spot to be had. Great private beach access. Our only complaint-the Wi-Fi never provided Internet access the entire time we were there. Staff was friendly and helpful. This is the cleanest, most wonderful, beautiful, friendly resort we have ever visited. We didn't have an ocean-front site, but we could still hear the sounds of the waves. I can't say anything negative about this resort at all and was very sorry to have to leave at the end of the week. We will definitely go back. This park is a true resort. The sites are large and in great shape. The location is right off the 101 and above a secluded beach. The park has a very nice club house with all of the expected amenities. They even have working wifi. See our full review and pictures at www.thegilliamsisland.com. Wide variety of sites, some top notch others more like a small lot in between concrete walls with very bare essentials. Wonderful location. Weather can be unpredictable. Feels a little click-ish like some are owners and others not. No big deal, just smile and give God's love to the haters :-) Definitely, a must visit place especially if you get a front row lot to the ocean view. Worth the price if you get the right weather! The resort is well kept and the lots are privately owned, with some owners choosing to rent out their site. The rate was at peak time, $105 per night. Although we paid for two nights, we left after only one. It was very apparent that owners' who choose to not rent out their site, don't approve of the owners' who do and are forced to "tolerate" renters. We have never felt so unwelcome at any resort! What a disappointment. They said they had wifi and they don't. I booked 4 nights at $70 per night. I intended to get some work done. Otherwise the place is nice. It's like going to a very nice restaurant where the food is terrific, the ambiance is perfect, the service is great, but everything to drink tastes like crap. You can't choke it down. You wouldn't think that the clientele that comes here would put up with something so ghetto. 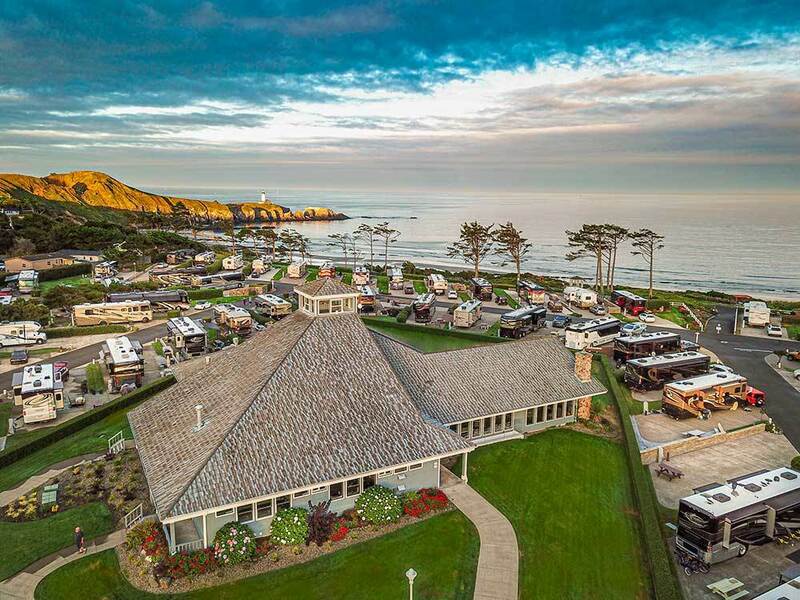 This is a beautiful motor coach resort on the shore of the Pacific Ocean. It is a very clean well-manicured facility. The sites are spacious with most either surfaced with concrete or pavers. The roads are paved and easy to navigate. The resort has gated access to enhance security. The utilities worked well except for the Wi-Fi which was nonexistent. When we checked in we were told to go to the clubhouse or office if we needed Wi-Fi. This is not acceptable especially at this very high priced motor coach resort. They need to spend some of their inflated rental fees on a good high speed Wi-Fi system and make it available throughout the park. Beach access is down a moderately steep long path with steps along the way. It is fairly easy to get down but not at all easy to walk back up. It is not handicapped accessible. For those who are not familiar with the Oregon coast be warned, it is not a warm area. We were surprised to find that daytime temps in the summer average around 60 - 65 degrees with strong winds blowing most of the day. It is also very foggy many days. Don’t expect to be able to sit out on the beach in your swim suit and relax. You need at least a light jacket almost every day throughout the summer. Cleanest and nicest RV park on the Oregon coast by far. Truly a five star resort! Staff is very professional, courteous and helpful. The resort seems to have something for everyone but especially the location. Grounds are well kept, sites are large and hook-ups very dependable. Limited experience with the owners, but found them to be welcoming and helpful. With large sites overlooking the Pacific Ocean to interior sites beside our Clubhouse or outdoor pool, you can own your piece of Paradise on Oregon's Central Coast. Original sales & re-sales both available. Amenities galore!